The Drive Medical Non-Tilt Height-Adjustable Overbed Table with Silver Vein Finish Base provides a spacious table area for use by a person while in their bed. 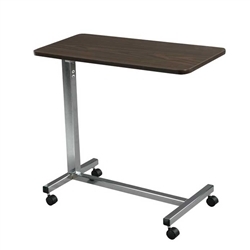 The non-tilting tabletop surface measures 15” deep x 26.5” wide and can be raised or lowered in infinate positions between 28” - 45”. The table top is a walnut wood grain low pressure laminate top. The table top locks securely in place when the height adjustment handle is released. The H base provides security and stability and features four 2” swivel caster wheels for easy maneuverability. The base and stand metal is a silver vein finish that is easy to maintain and looks less “institutional”.